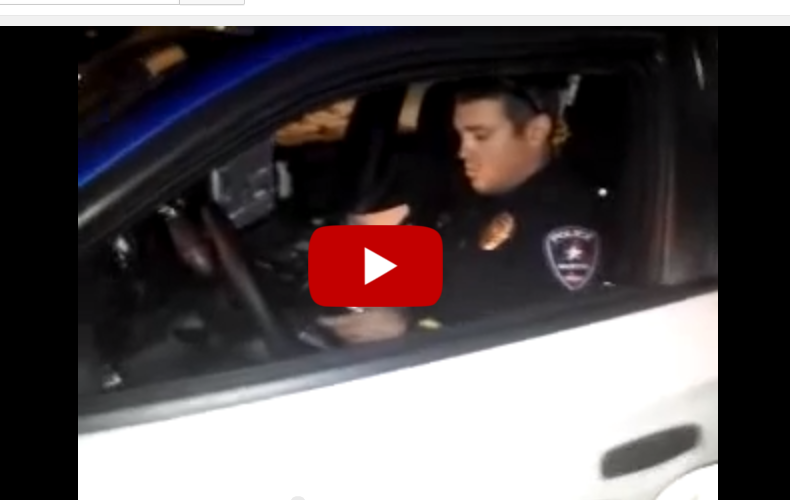 Cop watcher, Jake D, was out conducting police officer accountability Sunday night when he came upon an Arlington, TX police officer double parked. Although double parking in a private lot probably wouldn’t land you any tickets, it could very well land you tons of harassment by your local pd, especially being parked there at night. That harassment could easily turn into assault with a deadly weapon and kidnapping, if you had an ‘illegal’ part of nature in your car. Jake D, with Tarrant County Peaceful Streets Project, saw this opportunity to give an officer a taste of what it feels like to be shaken down when doing nothing wrong. In a classic move, he quickly rolls up on the officer and begins demanding the officer’s “papers,” followed by accusations of smelling marijuana; just like an officer would act towards a citizen. Jake D even gives the Free Thought Project a shout out during his police interrogation. Well done Jake, well done. Some will claim that Jake should have left this officer alone, and that Jake was making this officer’s job harder. And it’s those people who we’d like to remind that revenue collection via arbitrary traffic laws, enforcement of laws that persecute victimless crimes, and fining, kidnapping, or killing you for a plant, are the actual things that make lives harder. Being held publicly accountable, by a member of the public, should be welcomed by those who conduct themselves in an ethical manner.